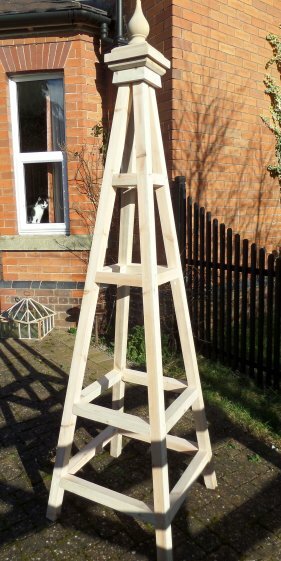 The Kingsbury Wooden Garden Obelisks are constructed from Scandinavian Red Pine. 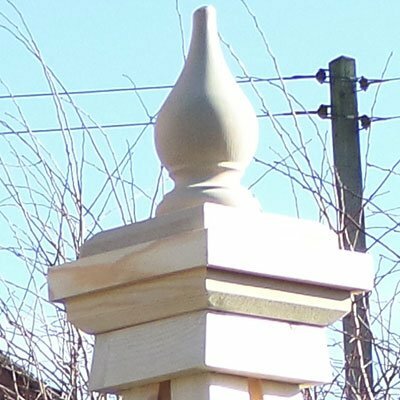 All the timbers are forty five millimetres square, other than the finial and all connections are bonded with high quality waterproof adhesive for durability and strength. It is topped with an onion shaped finial. An exclusive and attractive addition for your garden. 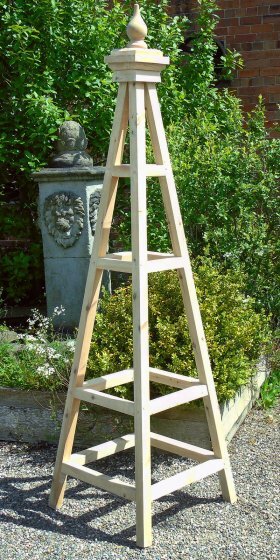 The Kingsbury Wooden Garden Obelisks are elegant Obelisks that stands 220cm tall and are 60cm square at the base. We also supply all our obelisks with eyelets and spikes to secure them to the ground. You can only use these if you are positioning the Obelisks on soil or grass. The standard finish is clear or Golden Brown preservative and we also offer Farrow and Ball exterior paint as a finish too. Clematis is a plant that looks wonderful when scrambling over an obelisk. They fall into three categories; those which flower on last year's wood, before mid-summer; those that flower in early summer and again in late summer, first on old wood and then on new growth; and then there are those that flower after mid-summer exclusively on new wood. encourage strong new shoots to come from close to the base of the garden obelisk. garden shears and re-shape them after theyhave flowered. The trickiest clematis to keep in shape appears to be the clematis that flower on the new and old wood. Because these clematis will flower twice on your garden obelisk they are a great addition to your garden but if you are not judicious with you trimming back you will only get one flush of flowers. The simplest way to handle them, if you would like to have both flushes of flower, is to prune in late winter. Cut some of the old growth back to the highest pair of strong buds, these will be breaking at this time and will flower last. Leave some unpruned to flower early . Once you have had your first flush of flowers prune about a quarter of the flowered shoots and so ensuring early flowering in the next year.